I recently read the post that Luigi's Flying Tires is closing and I thought I would create a thread for those interested or who have been on the attraction before. I went on it in 2012 after cars land opened and I could tell that the idea needed some work. You moved your tire around by leaning in the direction that you wanted to go. It just took too much time to load, and once on, grabbing the hard to reach beach balls became your only focus, instead of trying to bump into others. Soon they took away the beach balls, but I guess since then things still haven't worked out. The ride still seems like it could be fun with some new ride vehicles maybe, but I'm surprised it didn't even last a full 3 years. I'll miss uy, but I'm looking forward to what's next. Hopefully they keep the other rides, which are doing better right now. So, if you are in Disney's California Adventure before February 16th be sure to ride it as much as you can. Back in July 2015 it was noted that the new ride taking it's place would be called Luigi's Rollickin' Roadsters - but now, someone has caught a sneak peek (thanks to Media Meltdown Mousecast for the heads up) of the actual ride and it looks pretty darn close to the concept artwork! Can't wait to see more. This ride looks pretty amazing and looks like a fantastic addition to Cars Land. Below is an excerpt from our post regarding the news of the ride's opening date! Get your dancing shoes...'er tires ready as, Luigi's Rollickin' Roadsters is set to open to the public on March 7, in Disney's California Adventure. 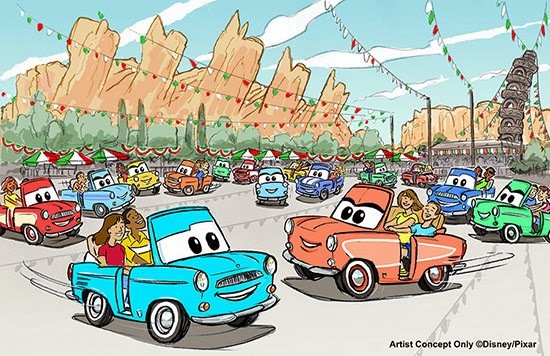 Nestled in the heart of Cars Land, the previous attraction Luigi's Flying Tires (which closed on February 17, 2015) has been re-imagined into an automotive dance party as 20 of Luigi's cousins have traveled to Radiator Springs from Carsoli, Italy. The attraction features a trackless ride system similar to the technology in Pooh's Hunny Hunt in Tokyo Disneyland - making Luigi's Rollickin' Roadsters the first attraction of its kind in a domestic Disney Park. As the cars begin to dance in a choreographed pattern, you'll notice the extra details that Disney Imagineering added with each individual car having its own name, personality and signature dance moves creating a unique ride experience each time. Wow this looks like a huge improvement over Luigi's Flying Tires! Can't wait to go back and ride it!